Up early, we packed up the room and checked out. We were in the car and rolling about 7:45 am. 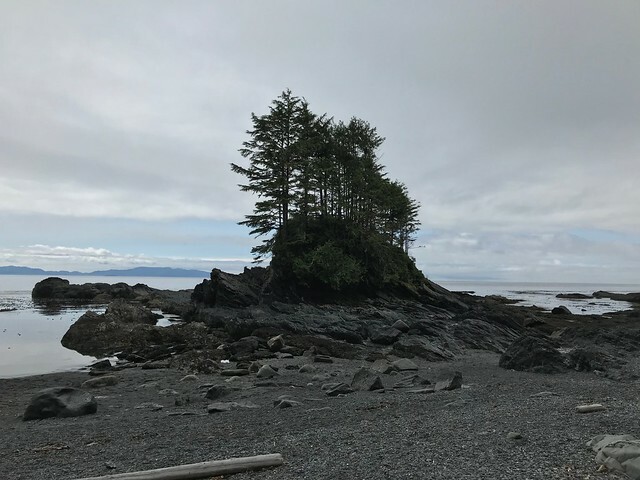 The plan for the day was wandering up the West Coast of Vancouver Island. We had breakfast at the Sooke Harbour House Restaurant. We both had Smoked Coho Salmon Benedict [Pickled Shallot, Winter Greens, Toasted English-style Muffin, Hollandaise, Root Vegetable Hash]. The food was solid. Given the hype for the restaurant, Sharon was disappointed in the meal. After breakfast, we drove up Highway 14 to Port Renfrew. We made one very quick stop at the mouth of the Jordan River. 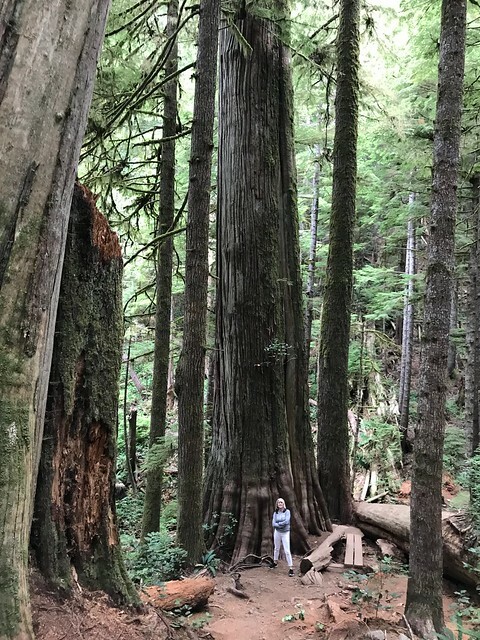 Our first goal was the Avatar Grove about 15 minutes north of Port Renfrew. This is a stand of old growth Douglas-fir and western red cedar. We hiked for about an hour through some amazing trees. One of the giant cedars in Avatar Grove has numerous huge burls and has been dubbed "Canada's gnarliest tree." From there, we headed to Botanical Beach Provincial Park. We hiked the Botanical loop trail. This included short side trips to Botany Bay and Botanical Bay. At this point, it was about 2:00 pm and we started east towards Nanaimo. The drive from Port Renfrew to Cowichan Lake on the Pacific Marine Road was through some very remote country. We stopped for a drink and some nachos at Jake's on the Lake. We rolled up to Geselbracht and Barb's house in North Nanaimo about 5:30 pm. When we were in Hawaii in February, the four of us talked about visiting in August! We are spending two nights with them. They invited over two other couples (Steve and Mel?) from the rugby club for dinner. It was a nice evening. The eight of us had dinner, visited and played cards until late. Sharon and I crashed in the downstairs bedroom.